SURVIVORS OF THE ROCK – ANECDOTE #2. Many of the recruits from outside of Auckland, making their way there on the ‘Red Rattler’ or whatever other salubrious transportation had been arranged for them, to offer their services to the country in the RNZN, hadn’t even heard of Motuihe Island, let alone knew anything about the history of the island. An island that had a varied and chequered history. The north end of Motuihe Island/Te Motu-a-Ihenga had a long history of Polynesian settlement before the Europeans arrived, with research indicating the Maori first occupied the island fro the 13th century. Two pa were constructed on the headland at Mangoparerua (located on the southwestern point of the headland) and Te Tumurae (located near where the cemetery now lies). Although little is known of the latter, Mangoparerua was a small refuge pa measuring about 20 x 30 metres and was noted as an important battle site. Little evidence now remains on the headland of Maori occupation. Maru Iwi was the first tribe in the area, but the island was conquered by Te Arawa in the 14th Century. Ngati Paoa later held possession of Motuihe Island and it was this iwi that was recognised by the Crown as the owners of the island subsequent to Europeans visiting the island. The island was said to have first been purchased by a Mr Butler in 1837, but no record exists of this purchase. The first recorded purchase of the island was on 5 November 1839, when Willian Fairburn purchased Motuihe from William Jowett, Ko Nuki and Te Manago: chiefs of Te Iwi Tutu, Te Ngatitai and Ngatiwaki respectively. The deed notes the payment for the island as being one heifer, twenty blankets, ten axes, ten hoes, ten spades, six gowns, two red blankets, 12 dutch pipes, six iron pots and one shawl. The following year it was sold to Henry Tayler, who purchased it with the assistance of a Crown Grant for £200. Farming on the island started under his watch. In 1864 Governor Grey issued an edict requiring all Health Bards and Port Boards to establish quarantine facilities. Stations were established at the four main centres: Somes Island in Wellington, Quail and Ripapa Islands in Lyttleton, and Quarantine and Goat Island in Otago Harbour. Auckland was the last to establish their facility and it was not until 24th December 1872, following the arrival of a ship with cases of small pox on board, that Motuihe was purchased from the then owner for £2500 and the entire island set aside as a human quarantine station by the Board of Health of the Port of Auckland. Work on quarantine station buildings began in 1873, including two large barrack buildings, hospital wards, a brick fumigation building with a tall chimney, stables and a cemetery. The first ship to be quarantined at Motuihe was the ‘Dorrette‘ in April 1974, with scarlet fever onboard. However, the first use of the cemetery on the island was not until 6th November 1874, when Mary Long a 16-year-old passenger on the ‘Hysaspes‘, died of scarlet fever the same day the vessel arrived at Auckland. Motuihe also hosted an animal quarantine station that was set up by the Department of Agriculture on the southeastern end of the island in 1892 and which continued to operate until 1930. In World War 1 the quarantine station was taken over as a POW internment camp. Amongst the first guests were 41 Germans from Samoa (then a German colony) a German New Guinea, captured when NZ occupied those places in 1914. The internees included the Governor of German Samoa, officials from the German Samoa Justice, Customs, and Post and Telegraph Departments, and the Telefunken engineers who had been working on the Apia radio station. Life on the island for the internees was not too arduous; they also had ‘free to roam’ during the day and were able to go fishing, collect fruit or swim. They were also allowed visitors. 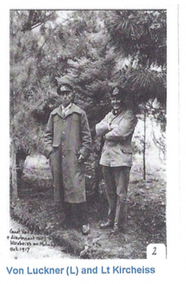 Some even accompanied the camp commandant on trips to Auckland to buy supplies not available at the camp canteen. In 1917 Motuihe Island made the news headlines, but not necessarily for the right reasons. The captain of the Germain raider Seeadler, Lieutenant Commander Count Felix von Luckner (known more by his title than his rank), and his navigation officer, Lieutenant Kircheiss, were interned here after their capture in Fiji in October 1917. On the evening of 13 December 1917, von Luckner, Kircheiss and nine others made an escape from Motuihe. The plan to escape had been in place before von Luckner arrived, but his status as a commanding officer and his experience s a raider made the escape more likely to succeed. After earthing the telephone wire at the wharf to prevent communication with Auckland and destroying the dinghy to delay pursuit, the escapees stole the camp commandant’s launch and set off into the night. They reached the Mercury Islands by the following morning. From there they commandeered the scow Moa and got as far as the Kermadec Islands; they had planned to get provisions from the depot there, commandeer another larger vessel and make their way to South America and eventually to return to Germany. However, they were recaptured on Kermadec Island on 22 December by New Zealand authorities. Von Luckner and Kircheiss were then interned on Ripapa Island in Lyttelton Harbour, before being returned to the Motuihe barracks in June 1918, where they remained until the November armistice. In December 1918 those who had been interned at Motuihe Island were transferred to Narrow Neck Camp. The quarantine station had been reactivated in 1918 to deal with the outbreak of the influenza epidemic that came to NZ through, amongst others, servicemen returning from the war in Europe. 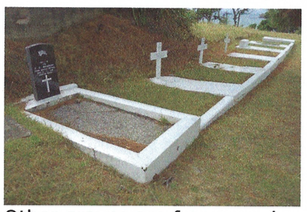 Five graves at the cemetery date from the period of November – December 1918, including the only official war Grave on the island, that of Private Frederick Donovan Bradbury, Home Service Section, NZ Military Forces, a guard on the island who died on 12 November 1918 aged 30. Other graves are from people who had been on board the RMS Makura that was placed in quarantine there. As the quarantine station was seldom used from the 1920s, in 1929 the Community Sunshine Association was permitted to use the quarantine station buildings or the establishment of a children’s health camp on the island. These camps had been introduced in NZ in 1919 to care for children at risk of malnutrition and diseases such as tuberculosis. They were aimed at improving each child’s health by providing lots of sun, rest, fresh air, exercise and nutritious meals. The facilities on Motuihe were also used to house and care for a large number of children evacuated from Napier after the earthquake there in 1931. When NZ entered the Second World Ware it was realised that a steady stream of trained men would be required by the Navy. The naval base at Devonport did not have the space of facilities to accommodate the increased training requirements and a new location close to Auckland was sought. In December 1940 the government approved the use of the quarantine station for this purpose. Motuihe Island was considered an ideal site for the new establishment as it was close tot he naval support facilities at Devonport, but separated from the ‘distractions’ of Auckland. The establishment was commissioned as HMS Tamaki on 20 January 1941, under the command of Commander Dennistoun, DSO, RN (Rtd), who came out of retirement to take up the position. The first trainee was Ordinary Seaman Ambler, who joined on the same day the establishment was commissioned. On 1 October 1941 the title was change to HMNZS Tamaki with the forming of the Royal New Zealand Navy. At the time the quarantine station facilities consisted of about 22 buildings and was able to accommodate up to 287 internees. Establishing it as a Navy training base cost £53,350 and involved building 15 new buildings including a provision store, a gymnasium and chapel, a naval and clothing store, a signal instruction building, a hospital, a dental centre and four large dormitories. The accommodation was now almost doubled to 517. Motuihe Island’s next phase in its history would last for 22 years and have a bearing on the lives of the greater majority of personnel who joined the Navy in New Zealand. SURVIVORS OF THE ROCK – ANECDOTE #1. INTRODUCTION: We have decided to write a monthly anecdote about HMNZS Tamaki, Motuihe Island in the hope that it will create an interest in the months leading up to the reunion in February 2020. We intend to cover a variety of topics such as: Life as a Trainee; “Do you remember?”; The history of the island and Tamaki; stories of our instructors; humorous stories/dits and invite ‘survivors’ to post their stories if they so desire. “A place where we have a right to stand. In a little over 15 months a ‘Ships Company’ of former sailors who served at the original HMNZS Tamaki on Motuihe island will once again return to the place where they began their naval careers, their turangawaewae. The ‘Ships Company’ of former trainees will be representing those who through sickness, poor health or no longer able to travel cannot be with them on the island. The wairua (spirits) of those who have ‘Crossed the Bar’ will no doubt be present. Life as a trainee wasn’t all gloom and doom; there was a balance of “good and not so good” instructors, we got paid, got to see the bright lights of Auckland, a movie night, played sport, some were even lucky to meet young ladies from the ferries. However, the most important thing that happened on that island was the adversity that many had to endure which forged a special bond and through that many life-long friends were made. Hopefully, we will be reunited with some of our mates again after 56 or more long years. The main focus of this reunion is to get every ‘man-jack’ back on our island where we hope to have a plaque unveiled, a wreath laid, a short service conducted, have fun in reminiscing, spinning dits and remembering where everything used to be in the camp. Our time on the island may have passed into history, but it is essential for us to leave something of ourselves to say that we were there, we were real and we were sailors.